The following post is from Jenny Matthews, who is involved with the SQUASH campaign. Here she looks at another example of media myths and distortions about squatting. Here’s a nasty little piece which was brought to our attention from the Enfield Independent: a particularly flagrant example of lazy journalism and the persecution of unauthorised occupants. Astounding in its lauding of deeply inhumane acts being perpetrated against the homeless by an organisation which supposedly aims to “help peple achieve more for themselves …[and] house people in need”, the article is riddled with inaccuracies and distortions, and, conveniently, lacks a byline to inform us who is responsibe for this mindless drivel. It’s hard to know quite where to start, but let’s have a brief look at some of the problems with this article. 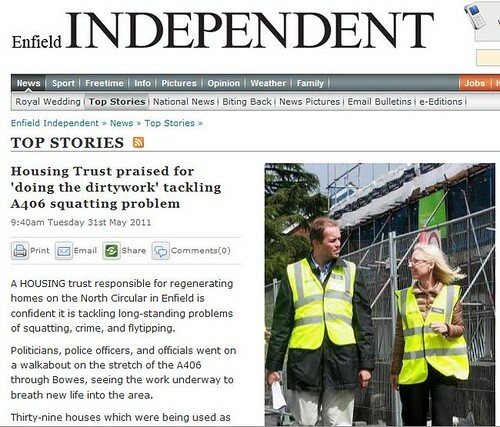 It is worth noting first and foremost that this article implicitly and explicity depicts squatting as a criminal act. As discussed in the earlier post from Nearly Legal, and as we sometimes get tired of hearing ourselves repeat, Squatting Is Not Illegal. Filed under “crime,” the squatters are described as “illegal occupants,” and, bizarrely, the main source of information about them comes from the “Environmental Crime Officer.” In what way the use of empty buildings by homeless people has any relevance to crimes against the environment remains mysterious. Equally mysterious is the evidential basis for his accusations that the residents were responsible for “many of the issues blighting the area.” Which issues exactly? The article cites a total of zero examples of any squatter from that area being convicted or even arrested for a criminal offence. The implication that they were responsible for these houses either being run-down or being empty, or both, is logically absurd: buildings must be empty in order to be squatted; and since a building’s being “derelict” is definitionally a result of disuse, it makes no sense whatsoever to claim that those who have finally returned the building to use as a home are responsible for it’s dereliction. If this sounds more like a programme of destruction than of “rennovation,” you obviously have much to learn about urban regeneration. Step 1: make all the poor people leave. Step 2: employ heavies to patrol the empty buildings and ensure that the evicted residents don’t seek shelter inside their old homes. Step 3: blame the ex-residents for everything that has ever gone wrong in the area, and cast the landowners, politicians and police as the saviours. Cue gentrification, further marginalisation of the poor, and the annihilation of whatever remnants of community may have survived the past half-century of fragmentation. Investment in homes is a good thing. But the destruction of houses, keeping properties empty through force, intentional homelessness, and the libellous treatment of squatters in the press are not a necessary part of that process. “People know that they are not getting back in,” celebrates the final sentence of the article: which is precisely the point. Current systems of landownership and property development keep a growing segment of society locked forever outside of secure homes. Why on earth we should be praising a Housing Association for their role in the perpetuation of this insecurity seems rather obscure. The Empty Homes Agency's monthly news bulletin in June 2007 states that 100's of houses were compulsary purchased by TFL in the 1970s, of which 80 remain standing. This image links to the bulletin.